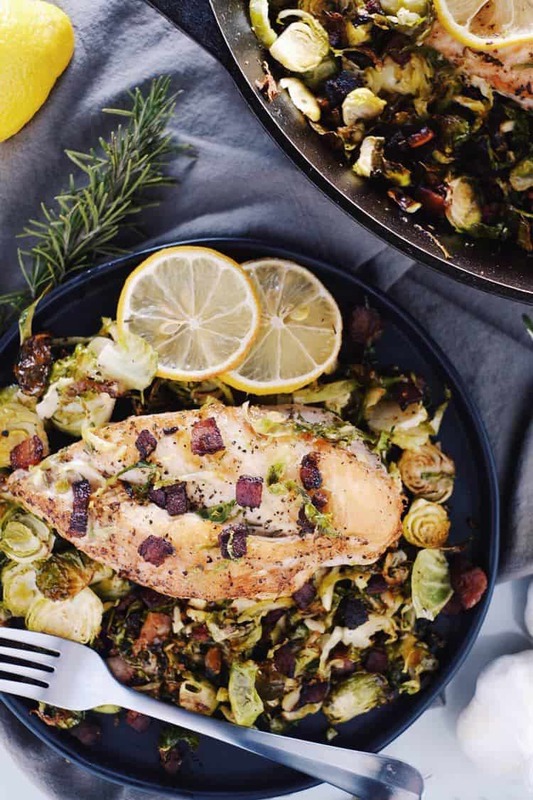 This chicken skillet with bacon brussels sprouts has tons of complimentary flavors. Garlic and rosemary are one of our favorite combos, and lemon is just a refreshing layer on top. 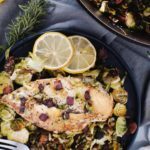 You can’t beat this one pan chicken skillet with bacon and brussels sprouts for an easy weeknight meal you can throw in a cast iron skillet and have ready in about 45 minutes, most of which time you are simply letting it bake in the oven. Just brown the chicken in the skillet and throw the rest of the ingredients in to cook in the oven. It is really that simple! And seriously so delicious! And now on the plate ready to be devoured. 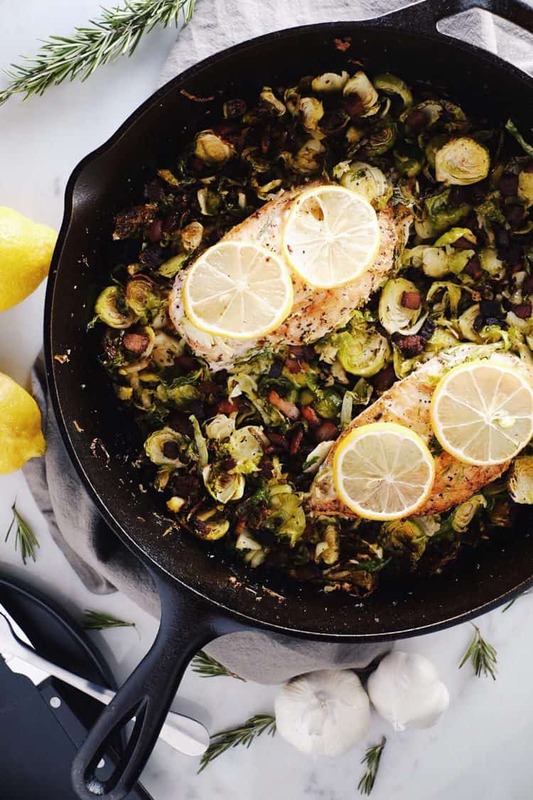 Enjoy this easy, flavorful, one-pan chicken skillet with bacon brussels sprouts. Let us know how it goes by leaving a comment below. Also, take a photo and tag us on Instagram @realsimplegood, so we can check it out! 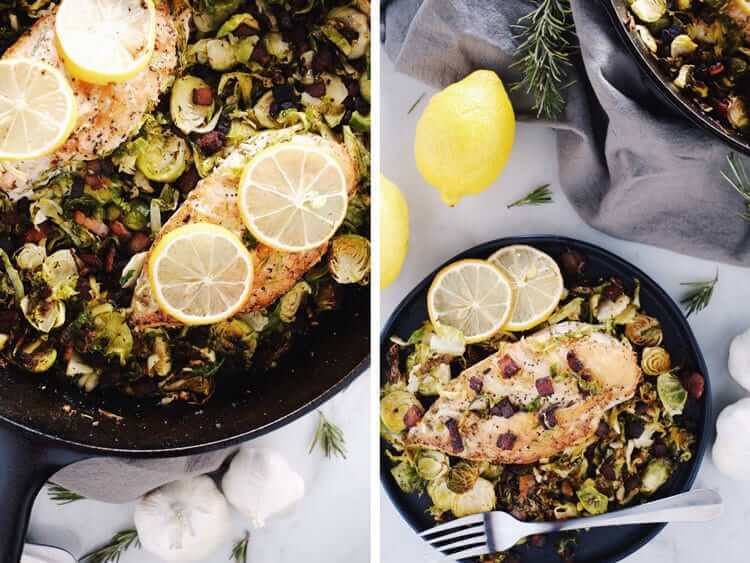 This one pan chicken skillet with bacon brussels sprouts is refreshing and flavorful. It's great for a weeknight dinner with minimal effort. Cook the diced bacon until it starts to brown and is just beginning to get crispy on the sides. Remove from the skillet and place on a paper towel lined plate. Sprinkle the chicken with salt & pepper on either side. When the bacon is done, add garlic to cook for 1-2 minutes, stirring frequently. Place chicken directly on top of the garlic to brown it on each side. It should just take about 5 minutes each side, depending on how thick your chicken breasts are. Once the chicken is browned, add your brussels sprouts and rosemary into the skillet. Sprinkle the bacon on top. Season the pan with salt and pepper to taste. Use an oven mitt and move your skillet to the oven and bake for 25-30 minutes, depending on the size of your chicken breasts, until the chicken is cooked through. This is one of my husbands and my favorite dishes, he asks for it again and again and again….I’ve lost track of how many times I’ve made it! Soooooooooo good! This, ladies and gentlemen, is true comfort food, and good enough for company! Aaaww!!! Thank you so much for the amazing review! This is one our favorites, too! You totally just made our day! Thank you again!